The DEWALT 16 oz. one-piece Steel Hammer has optimal weight distribution for a controlled swing. Its oval shaped strike face makes toe-nailing easy. This hammer also features a side nail puller for efficient and easy pulling. 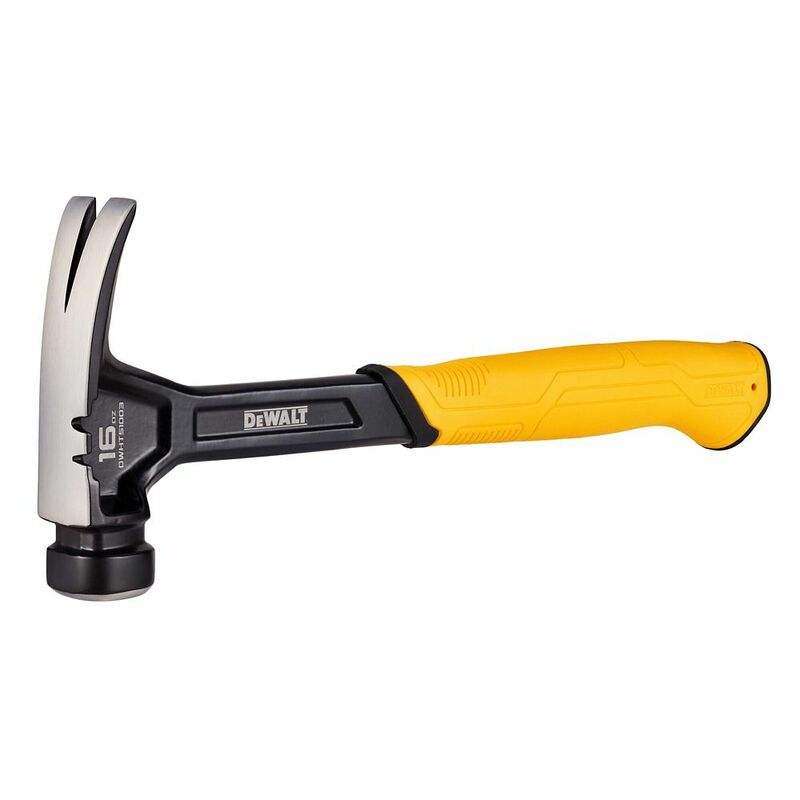 Its intuitive design made of a single piece of steel makes this hammer every durable. The DEWALT<sup></sup> Demo Hammer is a multi-functional tool designed to overcome even the toughest demolition job. With an oversized strike face for breaking through drywall and an elongated claw curve for easy prying of nails, standard hammer features have been optimized for demolition applications. A unique 2x4 gripper has been added, making prying floor boards and framing easy. The DEWALT<sup></sup> Demo Hammer is the all-in-one tool designed for the particular needs of remodelling and residential/commercial demolition. The new Ultra Series hammers from Estwing. These hammers are light, to drive nails faster and forged in 1-piece out of fine tool steel for long life and dependability. Ultra Hammers are designed with the professional in mind. Ultra Hammers are stronger than the competitors because they are forged in 1-piece of steel, no welding, and no joints that can fail. These tools have the world famous and patented Estwing Shock Reduction Grip. The grip which reduces vibration up to 70% is bonded on and will not come off. Estwing hammers are the only hammers that can make this claim. An extra nail pulling notch is built into the head of our hammers for use in tight spots. These hammers also have a magnetic nail starter in the head. This tool has unsurpassed balance and temper. This 15 oz. hammer has a smooth face for no marring, and regular length handle. Made in USA. Protect your eyes from flying particles and dust. Always wear safety goggles. Bystanders shall also wear safety goggles. This 16-ounce dead blow hammer is perfect for any job where you need to strike objects hard without damaging them. The internal construction of the head was engineered to minimize rebound, absorb shock and maximize the impact delivered. 16 Oz. One-Piece Steel Hammer The DEWALT 16 oz. one-piece Steel Hammer has optimal weight distribution for a controlled swing. Its oval shaped strike face makes toe-nailing easy. This hammer also features a side nail puller for efficient and easy pulling. Its intuitive design made of a single piece of steel makes this hammer every durable. 16 Oz. One-Piece Steel Hammer is rated 4.9 out of 5 by 28. Rated 5 out of 5 by HomeDepotCustomer from This is a wonderful product, works great!... This is a wonderful product, works great! Rated 5 out of 5 by Rejod from First time in a long time (over 20 years) with... First time in a long time (over 20 years) with a new hammer, in younger days swinging a 22 oz.. Well done Dewalt! I love the balance and versatility. Rated 5 out of 5 by BobG999999 from Got this for my wife, she didn't need a "women's tool" that was pink ... This is a nice weight fo... Got this for my wife, she didn't need a "women's tool" that was pink ... This is a nice weight for her, and is well-designed with some nice features. It feels well balanced, and has a nice "throw", not that I'm throwing it!